Christina Ricci attended the ‘Z: The Beginning of Everything’ Discussion and the New York Premiere, both on Wednesday (January 25). 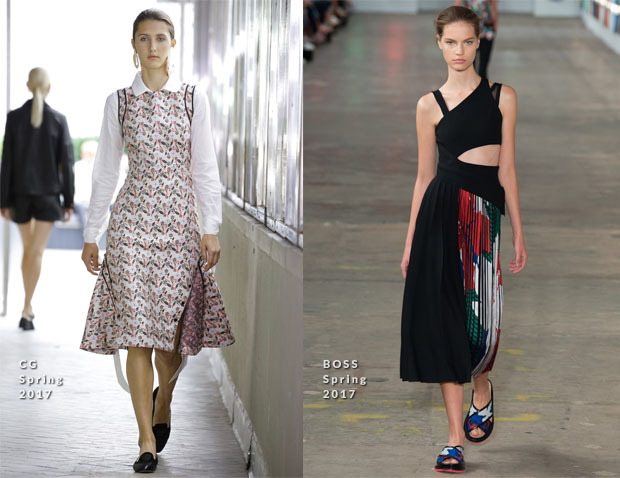 ‘Z: The Beginning of Everything’ Discussion: Had the actress worn this CG Spring 2017 fit-and-flare, vintage-print frock with the white blouse as originally presented, it would have likely been too overwhelming for her petite frame. I do wish she had skipped the tights to help lengthen her leg line just a bit. ‘Z: The Beginning of Everything’ New York Premiere: While Christina can be hit or miss with her looks, this BOSS Spring 2017 dress was an impressive one for her. The flattering, asymmetrical cutout silhouette made as much of a splash as the bold print in the pleated skirt. The heavy, suede shoes are another story, but I’ll do my best to ignore them.